Originally published as an award-winning paperback: A Hike for Mike. Jeff Alt takes you vicariously along the John Muir Trail, on an entertaining adventure, with his new wife, Beth. Jeff convinces Beth, a woman who prefers hotels, hot showers and warm beds to chuck her domesticated ways and hike over 218-miles which leads to lots of humorous moments. Together, they traverse three national parks, including the highest mountain in the contiguous United States, Mt. Whitney. Jeff is compelled to take Beth on a hike after her brother tragically dies by suicide. Jeff thinks the hike will do Beth some good. They walk in her brother's memory as a depression awareness campaign. The Alt's journey is full of inspiration and adventure; from menacing bears, to lightning bolts, mountain lions, food shortages, and altitude sickness. Beth discovers the trials and joy of backpacking and they emerge from the trail rejuvenated. Jeff Alt's adventures have been featured on ESPN, Hallmark Channel, in the AP, and more. Alt is a celebrated author and a talented speaker. 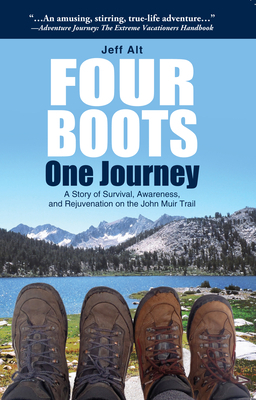 He is the author of Four Boots One Journey, Get Your Kids Hiking, and A Walk for Sunshine. A Walk for Sunshine, won the Gold in the 2009 Book of the Year awards sponsored by Fore Word Reviews, it took first place winner in the 2009 National Best Books Awards Sponsored by USA Book News, and won a Bronze in the 2010 Living Now Book Awards sponsored by Jenkins Group. Get Your Kids Hiking won the Bronze in both the 2014 Living Now Book Awards, and the 2013 IndieFab Award in Family and Relationships. Alt is a member of the Outdoor Writers Association of America (OWAA). He has walked the Appalachian Trail, the John Muir Trail with his wife, and he carried his 21-month old daughter across a path of Ireland.